Actor and presenter Stephen Fry has said he is considering giving up on the micro-blogging website Twitter. "Think I may have to give up on Twitter. Too much aggression and unkindness around," said Fry, who has more than 900,000 followers. His comment followed an online disagreement with another user of the social networking site. Fry is known as one of the most prolific celebrity "tweeters" and has openly supported it in interviews. He sent a message - or tweet - to the user with whom he fell out, saying: "You've convinced me. I'm obviously not good enough. I retire from Twitter henceforward. Bye everyone." Has Twitter lost its magic? However, he later posted another tweet which indicated that he may change his mind about leaving the site. "Well maybe I'll see how I feel in a few days. Very low and depressed at the moment and any drop of meanness makes it so much worse. Sorry." The disagreement began when the other tweeter said "I admire and adore" Mr Fry, but that he found his tweets "a bit... boring... (sorry Stephen)". That same tweeter later revealed that Mr Fry had blocked him as a result. Many other tweeters sent him messages of support and asked him not to leave the site. One user, @emilymay2 wrote: "Please don't leave Twitter Stephen! You are much loved." Another tweeter, @lesanto, wrote: "Yes, we need to support @stephenfry - just like we need to support anyone on here who needs it." And @edduk8 sent a message to Mr Fry saying: "Don't you dare quit. You're amazing, insightful and have a profound kindness. Ignore the unwashed masses and express yourself." However, not everyone has been supportive. 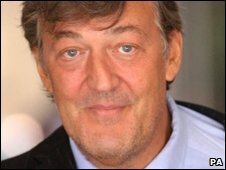 @Malcurion wrote: "The Stephen Fry story is NOT news, BBC, Sky, et al. Wake up." Mr Fry suffers from bipolar disorder, also known as manic depression, and has talked openly about his condition. In 2006, he made a two-part BBC documentary called Stephen Fry: The Secret Life of the Manic Depressive, which investigated the reality of living with bipolar disorder.